Community media is an issue which has been on EPRA’s agenda on several occasions. 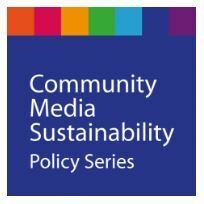 A noteworthy document of the network is the comparative report on Local and Community Media released following a Working Group held in 2013. Most recently, Michael Nicolai, President of AMARC Europe, spoke at the EPRA meeting in Edinburgh in May 2017 and Judith Purkarthofer, President of CMFE, will participate in a workshop at the EPRA meeting in Vienna in October 2017. CMFE will partner with leading European media organisations in a new project focusing on hate speech and on ways to tackle it through ethical journalism practices and accountable media reporting. Together with the European Federation of Journalists (EFJ), Article19, COMMIT, COSPE, Media Diversity Institute (MDI) and the Croatian Journalists’ Association (CJA), CMFE will organise training workshops for individual journalists, journalists’ organisations, media organisations, CSOs, community media and media regulators to counter discrimination and hate speech. We look forward to presenting the project at the CMFE General Assembly on Oct. 24 in Halle! CMFE is again present at the September meeting of the Committee of experts on media pluralism and transparency of media ownership, which is a subcommittee of the Steering Committee on Media and Information Society (Council of Europe, Strasbourg). Board member Lyacout Haicheur, in coordination with several experts and members of the board, acts there on behalf of CMFE and Community Media. “European Citizenship in Challenging Times” was a two days conference organised by the European Commission, in partnership with EUROM, Solidarity Foundation, the University of Barcelona, under the “Europe for Citizens” programme 2014-2020.